This guide is to help you make sure Occult Watcher is set up properly and ready to use on your netbook. Start by finding the Occult Watcher icon in the taskbar in the lower right corner of the screen. You may need to click the small upward arrow to show hidden icons. Right click the Occult Watcher icon (you can do this on the netbook by pressing the bottom-right corner of the trackpad), then select Configuration. 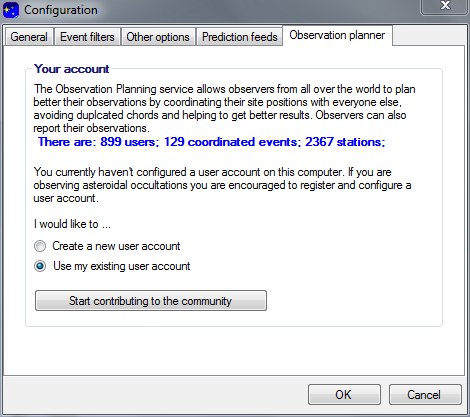 In the Configuration window, select the Observation planner tab, then select the appropriate radio button (create a new account or use an existing one) and click “Start contributing to the community”. If you already have an Occult Watcher account, use that one. Otherwise, you’ll need to create a new account, using “RECON – [community]” as the name. After you’ve successfully logged into your account, click on the General tab. 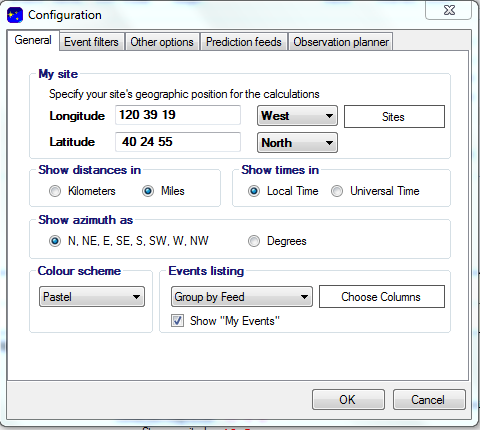 Click the “Sites” box, and select your location to automatically fill in the longitude and latitude. Press OK. Your Occult Watcher software is now fully configured. You can open the main window at any time by double-clicking the icon in the taskbar. Now that you have signed into Occult Watcher, you can use OW to sign up for RECON events.